Without knowing even the decade they’re from, you can date ninja films from the way the actors and stuntmen move and pose. In the 50’s, movie wizards mimicked traditional paintings and gestured like kabuki actors. In the 80’s Sonny Chiba had his JAC folk posing like superheroes. The 2000s saw digitally assisted non-martial artists take over lead roles, so the filmmakers were always trying to hide the lack of physicality of pop stars or teen idols. The redefined shinobi of the 60’s Japanese craze were coached by legit martial practitioners like Masaaki Hatsumi, with emphasis on credibility. The posing was right out of secret scrolls, they moved like commandos and did arcane spy tricks no one had seen before. From Raizo Ishikawa on the big screen to Maki Fuyukichi on TV, there was definitely a visual vocabulary used by the ninja stars of the day. 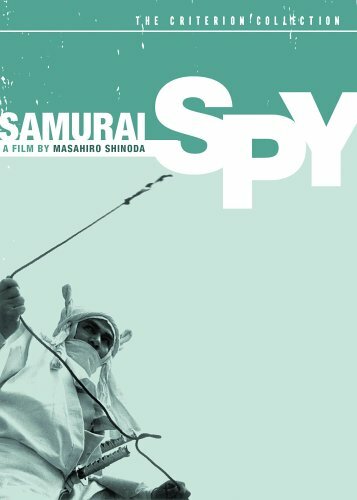 BUT… as we’ve established the last two days, Shinoda just had to do things differently, and Samurai Spy features some truly odd character posing and combat staging in some of the wierdest framing set-ups ever. Sasuke, cornered like a rat, surrounded by aggressive enemies, strikes these defiant hero poses. There is, however, a certain quality of fear behind the bravado. He's stiff, uneasy, vulnerable, and remarkably under-armed for the full-scale battle he's entered. Tanba's Sakon is a total contrast. He's a shifty spy with a lot to hide, but he hides in plain sight - from the white robes to these decidedly un-ninja-like, Musashi-esque twin sword poses. His is an equally false bravado, maybe brought on by overconfidence. From the way Sasuke holds his katana to the placement of crucial characters way to the sides of uncluttered frames, everything in SS is different from its contemporaries. The more I scrutinize this film, the more I’m thinking it might be the weirdest ninja movie ever made. Tomorrow: Often flashing so fast they barely register, we look at some absolutely gorgeous cutaway close-ups, and one of the strangest ninja weapons ever put on screen. Buy the highly recommended Criterion DVD at VN’s Amazon store.